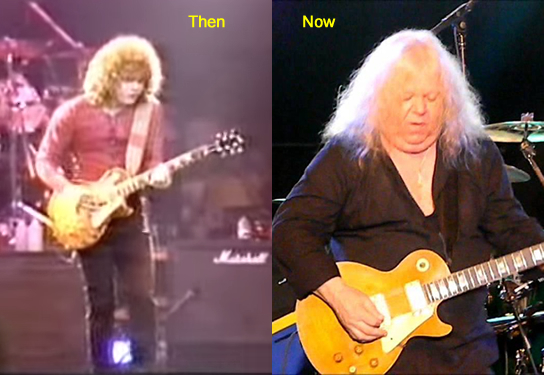 Reo Speedwagon guitarist Gary Richrath has died, the band announced on its website and Facebook page Sunday. He was 65. Band frontman Kevin Cronin said in a message that "my longtime friend and collaborator Gary Richrath passed away earlier (Sunday)." He did not disclose a cause of death. "I feel so sad," Cronin wrote. "Gary was both a unique guitarist and songwriter, and the embodiment of the tough guy with a heart of gold." He said he learned most of what he knows about being in a rock band from Richrath. "The entire REO Family mourns his death and shares in the grief of his family, friends, and fans," he added. "These words do not come close to expressing the depth of emotions I am feeling at this time." He added that a photo of the two on stage performing "has been on my music-room table for as long as I can remember, and will stay there." Richrath joined Speedwagon, known for its 1980s ballad, Can't Fight This Feeling, in 1970, three years after the band was formed in Illinois. Based in Peoria, he was known as a songwriter as well as a guitarist, and helped grow the band's popularity beyond its original Midwestern stronghold. Richrath also brought new songs to the band, including Ridin' the Storm Out. He recorded 12 albums with the band and also wrote another song, Take It On The Run. He sang lead vocals on Find My Fortune and Only A Summer Love. The last album he recorded with the band was 1987's Life As We Know It. He left the band in 1989. According to UltimateClassicRock.com, Richrath released one solo album, in 1992, Only the Strong Survive, but reunited briefly with the band in 2013 when they staged a benefit concert for residents of central Illinois displaced by a series of powerful storms in the area. I can only guess his health was abysmal. That picture is from the peak days in REO. In recent years, he is totally unrecognizable.